In this classic easy card magic trick, you have a spectator select a card and then lose it in the deck. You rest your first finger on top of the deck and as you lift your finger, the spectator’s card mysteriously rises with it. 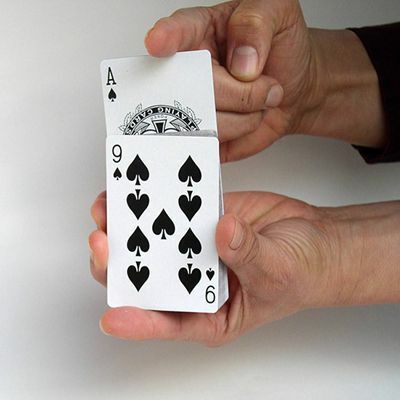 This effect is one of the best easy magic tricks for beginners and kids to learn and perform. Rising Card - Necessary Skills. It’s all in the hands, which we’ll demonstrate in a later step. Find the spectator's card and place it on top of the deck. Hold the deck in your left hand and point the first finger of your right hand just above the deck. If you are left-handed and want to perform the trick with your other hand, simply reverse the instructions. Rising Card - Performing the Trick. You bring the first finger of your right hand down until it’s resting on top of the deck. The Rising Card - The Rise. As you slowly lift your right first finger, the spectator's selected card mysteriously rises with it, out of the deck. The Rising Card - The Secret. When you rest your right first finger on top of the deck, you secretly extend your right little finger until its tip is resting on the back of the top card, the spectator’s selected card. You do this behind the deck so spectators can’t see the move. The Rising Card - The Secret, Part 2. As you raise your right first finger, press your right little finger into the back of the top card so that the card rises up with your hand. To spectators, it will appear that the selected card is rising with your right first finger. When the card is approximately halfway out of the deck, simply grab the top edge of the card with your right first finger and thumb and quickly curl your right little finger in. You can freely show the card to spectators and even allow them to examine it. There’s nothing to find. You can play this in different ways. Since your finger is actually touching the playing card as it rises, you can say that you have charged your finger with "static electricity" and can even rub your finger on your clothing to make it look as if you are charging with "massive amounts of static electricity." This theme turns your card trick into a "science" themed trick.